Crawling through the dense jungles of Bangladesh in search of your next meal? It's not for everyone. Heck, even going north to Siberia for a big time hunt doesn't sound all that appealing either. Face it, the life of a tiger is pretty hard! What's much easier? Showing up as a tiger for the big costume party. You don't have to live in the wilds, hunting and being an apex predator. Nope! You can just have a good time and be super cute. And an even better idea? Getting your kiddo to be the cute tiger! Yes, we're sure that's going to be just the thing. So when it's time for your kid to get all tigered up, well, the first step is picking out the costume. We've got just a few choices to help you out with that. But. You'll want to get all the finishing touches just right, too. And we can help you out with that as well! 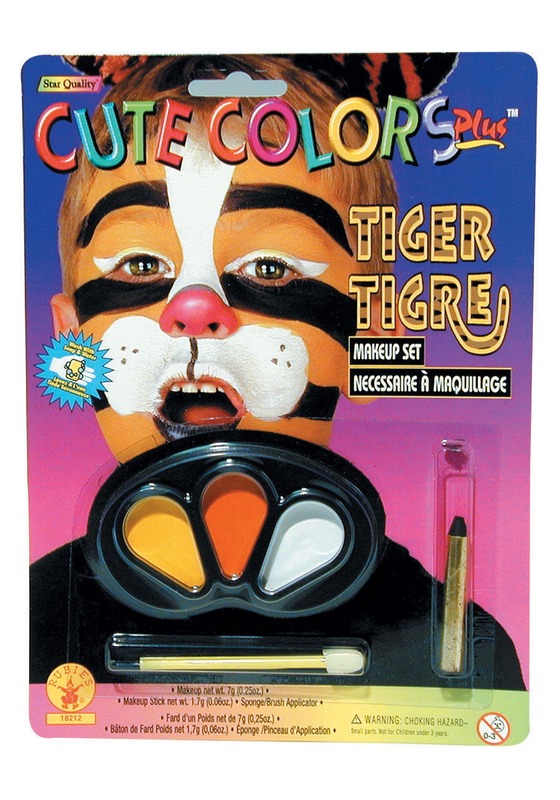 Just use this Tiger Makeup Kit, and your kiddo is going to be one fierce jungle cat! This Tiger Makeup Kit comes from Rubies Costumes Cute Colors Plus selection. It comes with yellow, orange, and white facepaint along with an applicator brush, and also a black makeup stick. This makeup set washes off easily with soap and water, intended for one-time use only.